Ganja La Pass Trekking is one of the hardest treks in the northern side of Nepal lies under Langtang National Park. Situated at an altitude of 5,122 meters above sea-level, Ganja La Pass Hiking requires an experienced professional guide to good pieces of equipment. The trek requires mountaineering practice and climbing gears. Only rare adventure and wilder lovers attend this trek. On the other side, the trek too offers the excellent closeup views of soaring white snow covered Langtang Range Mountains like Langshisha Ri (6,427 m), Kimshung (6, 781m), Langtang Lirung (7,227 m - highest in Langtang Mountains), Dorje Lakpa (6,966 m), Naya Kanga (5,846 m), Ganesh Himal (7,422 m - highest in Yangra), Gaurishanker (7,134 m - 2nd highest in Rolwaling), Yala Peak (5,520 m) etc. Besides these lofty white peaks, the trail equally provides an opportunity to observe diverse flora and fauna, wildlife such as Musk Deer, Tahr, Snow Leopard, Red Panda, Common Langur, Black Bear, and many other animals. Ganja La Pass Trek begins from Syabru Besi - a day drive from Kathmandu. Exploring the small Tibetan, Lama and Tamag Village on the trail, the third day arrives Langtang Village. Then head up to Kyangjin Gompa, the last Tibetan Village in the Langtang Valley. Visit the holy Buddhist Monastery, Cheeze Factory afterward, divert to the main destination of this trek, Ganja La Pass. Cross the Pass then exit the trek from Helambu Region at Melamchi Bazaar. The entire trek will finish in just 11 days from Kathmandu. Day 03: Trek to Langtang Village. Day 06: Trek to Ngegang. Trail Attractions: No Villages, Natural Vegetation. Max. Altitude: 4,000 m (Ngegang). Day 07: Cross Ganja La Pass and Trek to Keldang. Trail Attractions: Ganja La Pass covered with snow. Max. Altitude: 5,200 m (Ganja La Pass). Day 08: Trek to Dukpu. Trail Attractions: Walk along the ridge and grassland, and wonderful mountain view. Max. Altitude: 4,080 m (Dukpu). Day 09: Trek to Tarkeghyang. 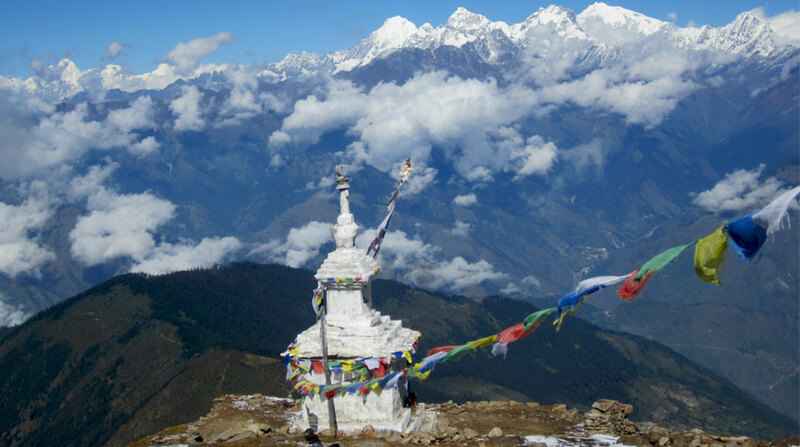 Trail Attractions: Mountain views from Everest Range to Annapurna Range, Rhododendron Forest, and Monasteries. Max. Altitude: 2,740 m (Tarkheghyang). Trail Attractions: Monasteries and Jugal Himal. Max. Altitude: 2,621 m (Shermathang). Day 11: Trek to Melamchi Bazaar and drive to Kathmandu. Twin Bed sharing teahouse/lodge/tent accommodation during the trek. Melamchi to Kathmandu by sharing a bus. Wants some modification on Ganja La Pass Trekking itinerary? contact us to customize it.